Thanks to The Right Planet for this linked cartoon. 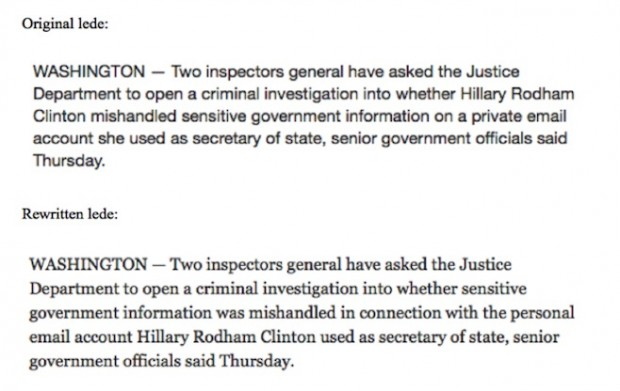 “Two inspectors general have asked the Justice Department to open an investigation into whether sensitive government information was mishandled in connection with the personal email account Hillary Rodham Clinton used as secretary of state, senior government officials said Thursday. “The Obama administration formally announced that inspectors general will have to get permission from their agency heads to gain access to grand jury, wiretap and fair credit information — an action that severely limits the watchdogs’ oversight capabilities, independence and power to uncover fraud. Since Obama has no effective opposition in Boehner or McConnell, will Obama also pardon Hillary to ensure the continuance of Obamacare?